Seven from Portsmouth Campus place in business competitions. 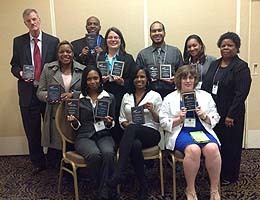 Seven students from Tidewater Community College’s Portsmouth Campus competed in Virginia’s Phi Beta Lambda state leadership conference in Richmond, and all placed either first or second in their respective categories, advancing them to the national conference in Anaheim, Calif., in June. The TCC students who took top honors are Ryane Everett (accounting analysis and decision making), Tauren Ortiz (economic analysis and decision making), Shavonda Eley (sales presentation) and the team of Everett, Briana Monk and Jacqueline Cochrane (business decision making). Second place winners are Shakeisha Jones (accounting principles) and Chase Boatmon (contemporary sports issues). TCC also placed second with the largest local chapter membership behind Longwood University. TCC’s PBL club has 20 members. back from left, Professor David Green, Instructor Nancy Prather-Johnson, Chase Boatmon, Ryane Everett, Tauren Ortiz, Briana Monk and Carla Perry. Conner and Debra Wells were recognized for their five years of service. In addition to TCC, Bluefield College, Emory & Henry College, George Mason University, J. Sargeant Reynolds Community College, Longwood University, New River Community College and the University of Virginia at Wise participated. Most of the students took written examinations before competing in hypothetical business situations. For example, Ortiz had to make several decisions for an onion company, Eley’s presentation centered on marketing a spinach dip, and the team of Everett, Monk and Cochrane had 20 minutes to prepare a presentation on the pros and cons of a small local company expanding to an out-of-town location.